Cardiff City's slim hopes of Premier League survival could hinge on Saturday's match at relegation rivals Burnley - but some data seems to suggest the Bluebirds are all but down. While Huddersfield and Fulham have already been relegated, Cardiff are 18th in the table on 28 points, five adrift of safety with six games left to play. Southampton and Brighton - 16th and 17th respectively - are the Welsh side's closest competition to beat the drop, while Burnley have played one game more and pulled eight points clear of the bottom three following last Saturday's precious win at Bournemouth. Cardiff are away at Burnley on Saturday and then they visit Brighton on Tuesday. The outcome of those matches could be pivotal - and the Bluebirds are up against it. According to the Euro Club Index data analysts, Cardiff have a 94% chance of being relegated, Brighton & Hove Albion have a 3% chance of going down, while Burnley, Southampton and Newcastle's chances of dropping down to the Championship are all rated at 1%. 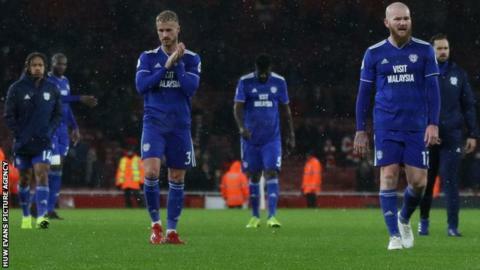 Simon Gleave, head of analysis at Gracenote, says: "If Cardiff City do manage to survive, it will be one of the greatest escapes in Premier League history." How many points do Cardiff need? Cardiff manager Neil Warnock believes 10 more points will be enough for survival, and the stats support that view. According to the Euro Club Index, 36 points is more likely than not to ensure a team stay up, while 37 is almost certain, so Warnock's projected total of 38 seems sound. There was a time when 40 was considered the magic number of points required to avoid relegation - but in recent years that theory has lost traction. Since the Premier League turned into a 20-team league in 1995-96, on only four occasions has a team needed 40 points or more to stay up. As the Euro Club Index analysis demonstrates, Cardiff would have a 99.9% of surviving if they were to reach 40 points but, in all likelihood, they would stay up with a total of 38 or more - as Warnock believes. "We need 10 points really to have any chance whatsoever," said the Bluebirds' boss. In all probability, Cardiff will need to get the ball rolling with victories at Burnley and Brighton because, after those matches, they host title contenders Liverpool. After a trip to Fulham, they then welcome Crystal Palace to the Cardiff City Stadium before finishing the season with a daunting trip to Manchester United. The odds - and the stats - are stacked against Cardiff, but that is just how they and their bullish manager like it. "We are running out of time and points," said Warnock. "I think everyone is presuming we are not going to get anything from Liverpool or Man United. "I don't see it that way. We've got to do the best we can and make sure we're in for something in both games. "I've never seen anything other than a fighting spirit."